Apple Music now has 50 million songs. Subscribers can stream Apple Music songs on iPhone, iPad, Apple Watch, Apple TV, Mac,. 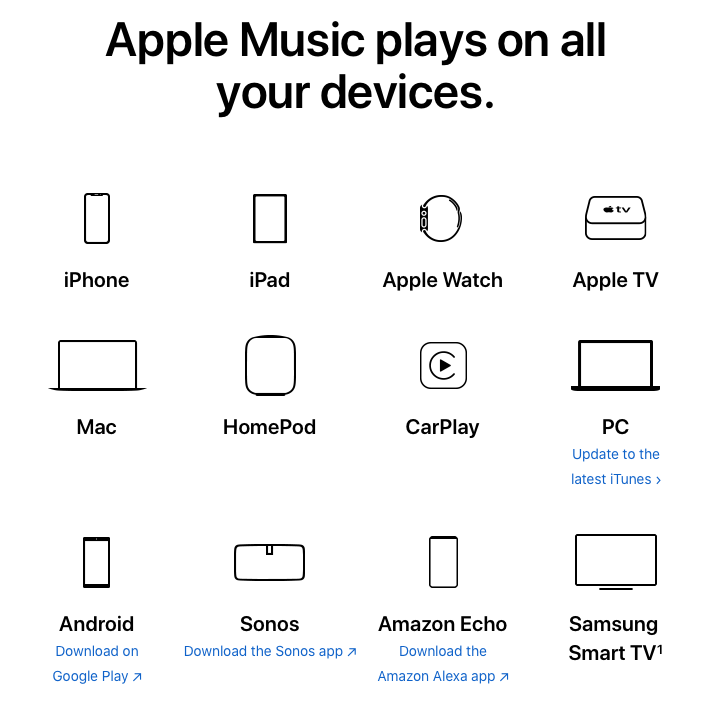 HomePod, CarPlay, PC, Android, Sonos and Amazon Echo or download any songs for offline listening. The downloaded songs are saved in Music - iTunes - iTunes Media - Apple Music. Check the songs and you will find they are in .m4p format, which is DRM protected and can only be played with authorized iTunes. Even though you have downloaded Apple Music songs to your iOS device or computer, you can't transfer them to your MP3 players such as iPod nano, iPod shuffle, SanDisk, Sony Walkman, etc. since Apple Music songs are DRM protected M4P file. If you want to enjoy Apple Music on a device which is not in above list, you need an Apple Music converter to remove DRM and convert Apple Music M4P songs to MP3 first. 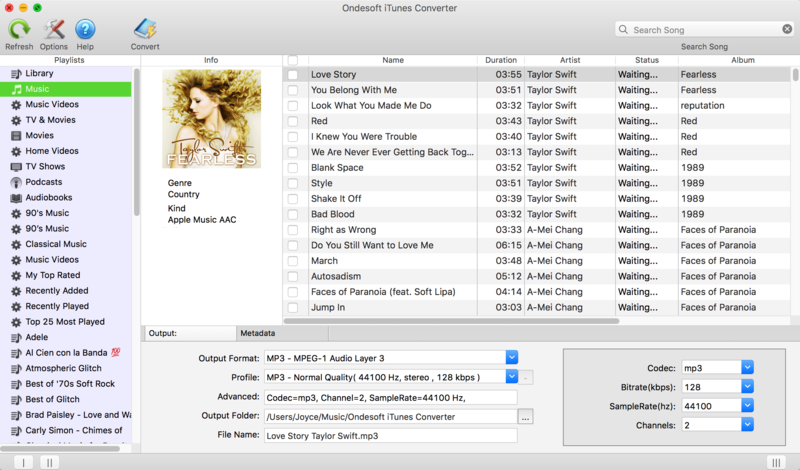 Ondesoft Apple Music Converter allows you to easily convert Apple Music M4P songs to MP3 at 16X speed on your Mac or Windows. What's more, you don't need to download the Apple Music songs to convert them since Apple Music Converter automatically syncs with iTunes Library and Playlists. 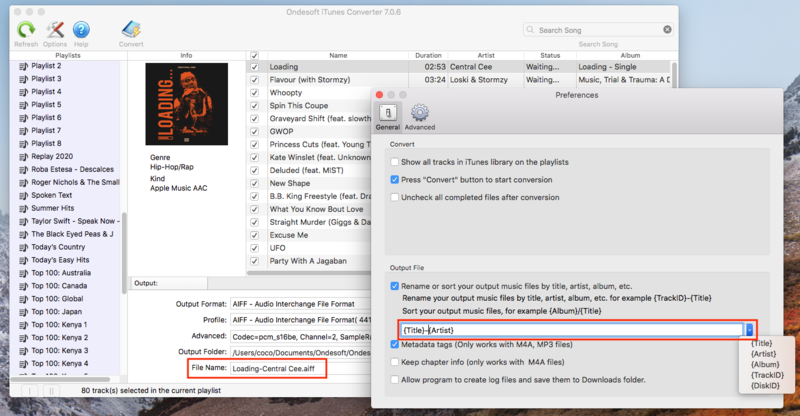 This tutorial will show you how to convert Apple Music songs to MP3 on Mac . If you subscribe to Apple Music on a Windows PC, check this tutorial . 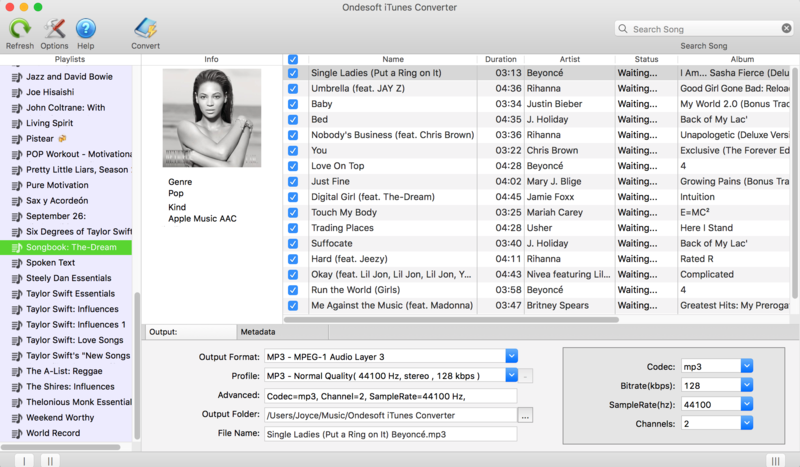 Download , install and run Apple Music Converter on your Mac. It will load the whole iTunes library automatically. How to add songs, albums or playlists to your Library from the Apple Music catalog? If you added Apple Music songs/albums to Library, click Music on the left side and find your songs. Click the top checkbox if you want to select all songs in the playlist. If you add playlist to Library, click the playlist name on the left side and all songs in the playlist will be shown on the right side. Check all of them or any one you want to convert. Select MP3 as output format. This Apple Music to MP3 converter also supports converting Apple Music M4P tracks to M4A, AC3, AAC, AIFF, AU, FLAC, M4R and MKA. For each output format, Apple Music to MP3 converter provides different profile settings: High, Normal and Low with different Bitrate, SampleRate and channels. You can also customize the value as you like. Output mp3 filename can contain Title, Artist, Album, TrackID and DiskID, such as Artist - Album - Track - Title.mp3. Click Options on the menu bar to open Preferences and customize output mp3 filename format if you like. Then all output MP3 songs will be in this filename format. Click Convert button to start converting selected Apple Music M4P songs to MP3. During converting, iTunes plays the Apple Music tracks in the background (muted), so you'd better not using iTunes before conversion is finished. 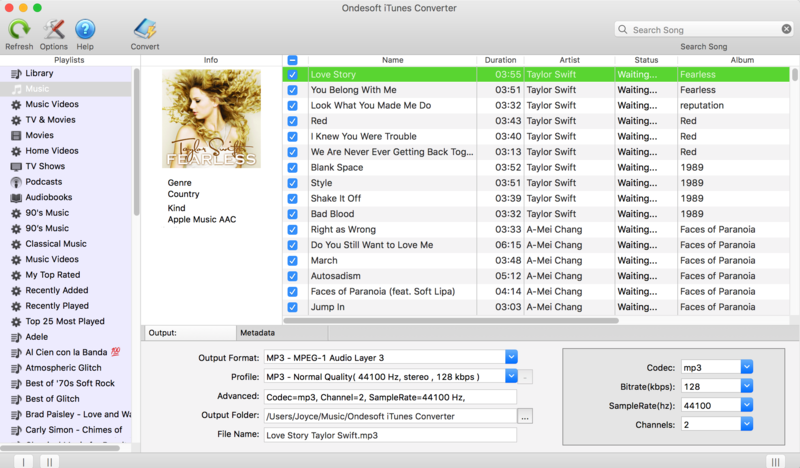 If you want to convert Spotify to MP3 , try Ondesoft Spotify Music Converter . Just add Apple Music tracks, playlists or albums to iTunes Library. Apple Music to MP3 converter will automatically load and show them on the interface. There is no need to download the tracks, playlists or albums if your internet connection is fast enough . Apple Music to MP3 converter allows you to customize Codec, Bitrate, Sample rate and Channels of the output file. Also you may save them as custom profile for future use. The powerful search function enables you to quickly find Apple Music tracks you need according to name, artist and album. Output file name can contain Title, Artist, Album, TrackID and DiskID and you are free to customize it as you like. ID tags such as song name, Artist name, Album, Album artist, Genre and Artwork will be saved to the output MP3 and M4A files. 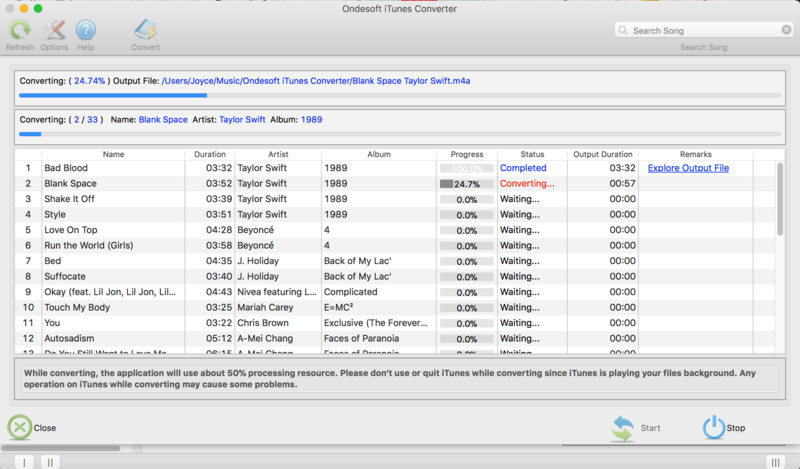 Batch conversion allows you to convert as many Apple Music tracks as you want at a time.